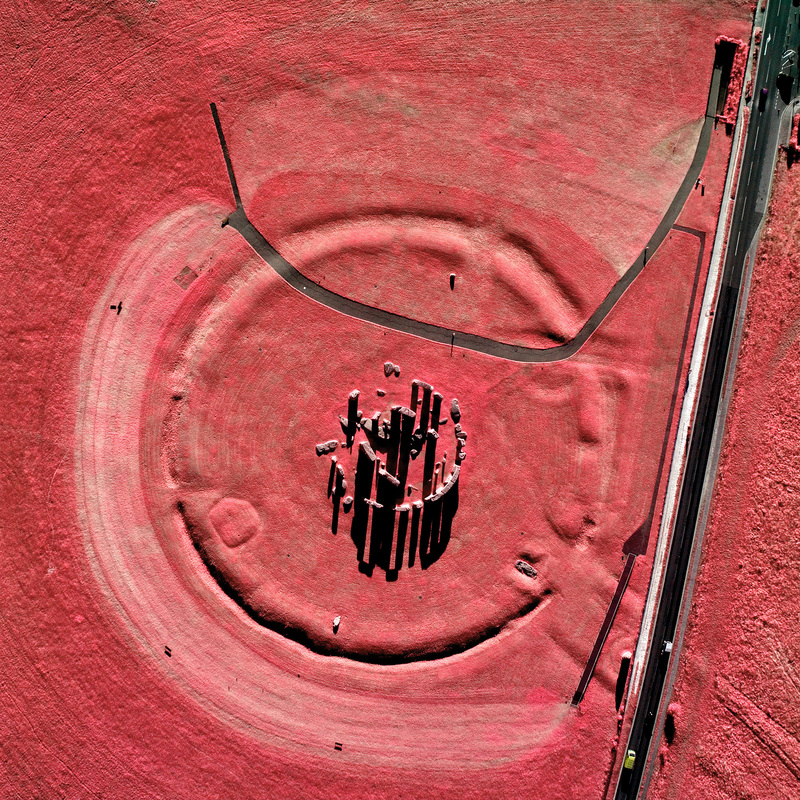 This image of perhaps the most famous site in the world shows the late afternoon shadows of Stonehenge's large standing stones and surrounding earth works. 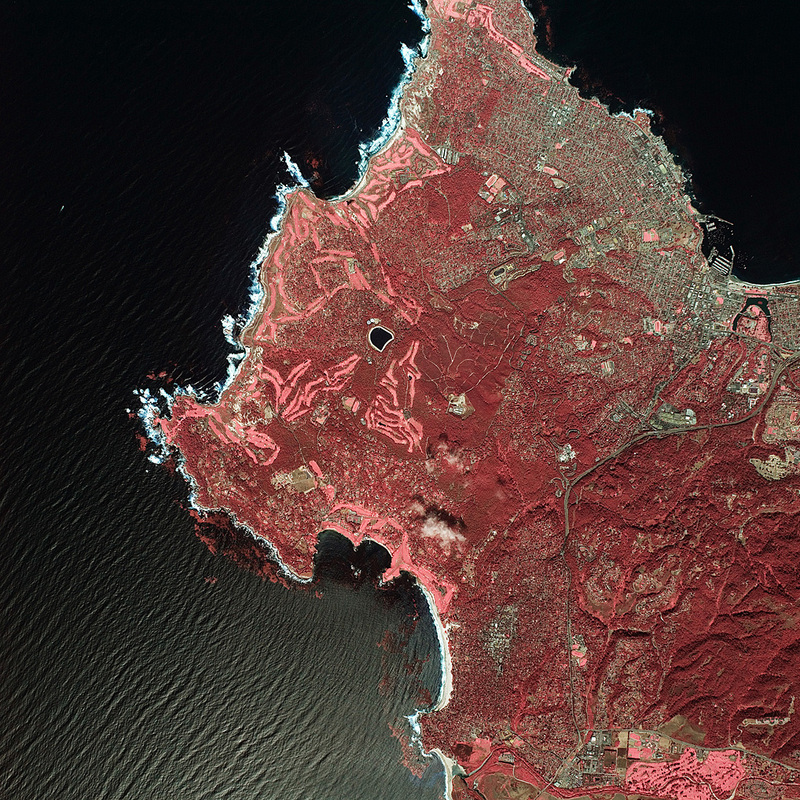 A color infrared image of Monterey and Carmel, located along the central California coast. Even from 65,000 feet you can easily discern the offshore kelp beds and the stark contrast between forest and grasslands. This image, taken over the salt marshes near Alviso, captures a passenger plane after takeoff from San Jose airport. This shows the Urban-Agricultural interface in one of the most productive food growing regions of the world that is the primary source for many crops around the United States. 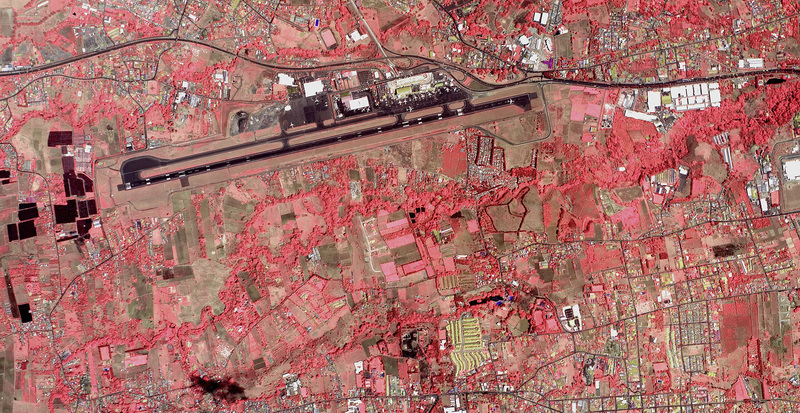 This example highlights the importance of Color Infrared imagery in post-disaster assesment. You can see the extent of the fire and the exposed slopes that may become deadly mudslides in Winter. 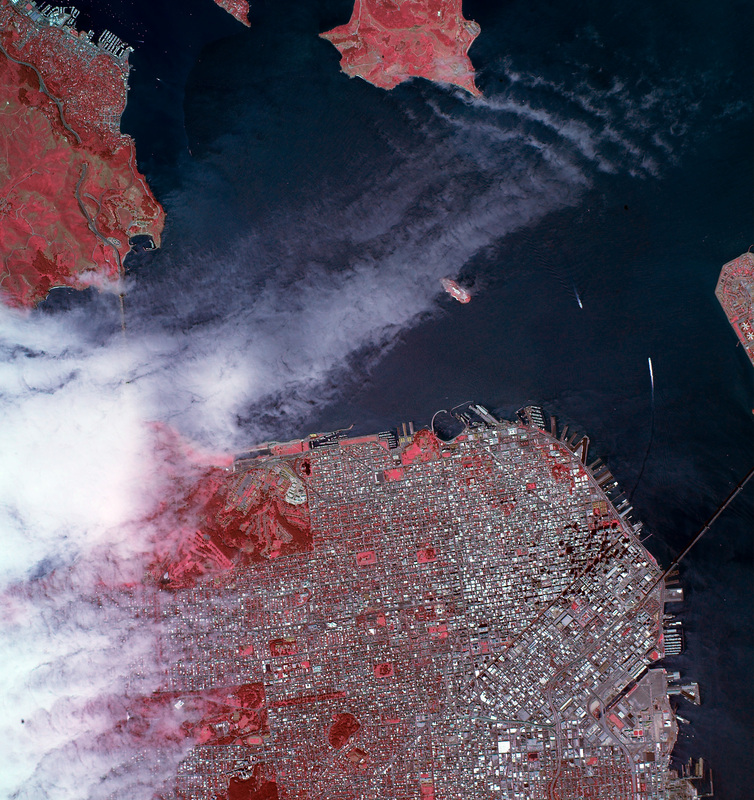 This photograph shows the cold Pacific fog streaming in over the many parks nestled in amongst the second most densely populated major city in the United States. In this mosaic of eleven images on the slopes below the Kilauea Crater, you can see the re-emergence of the native plant, Metrosideros polymorpha, along the lava flow crevices. 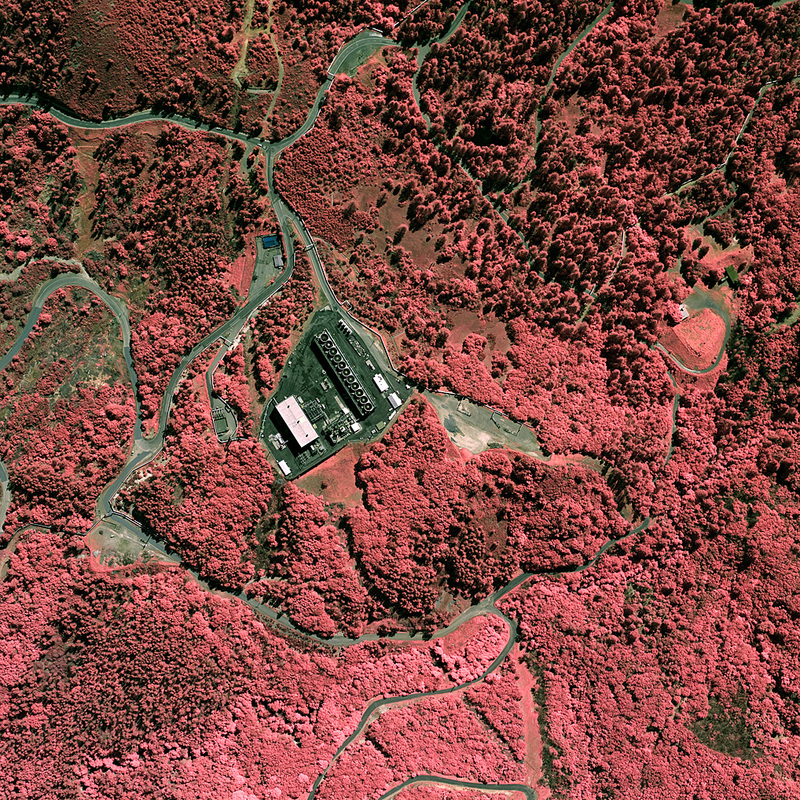 This image illustrates usefulness of CIR for differentiation of forest species. 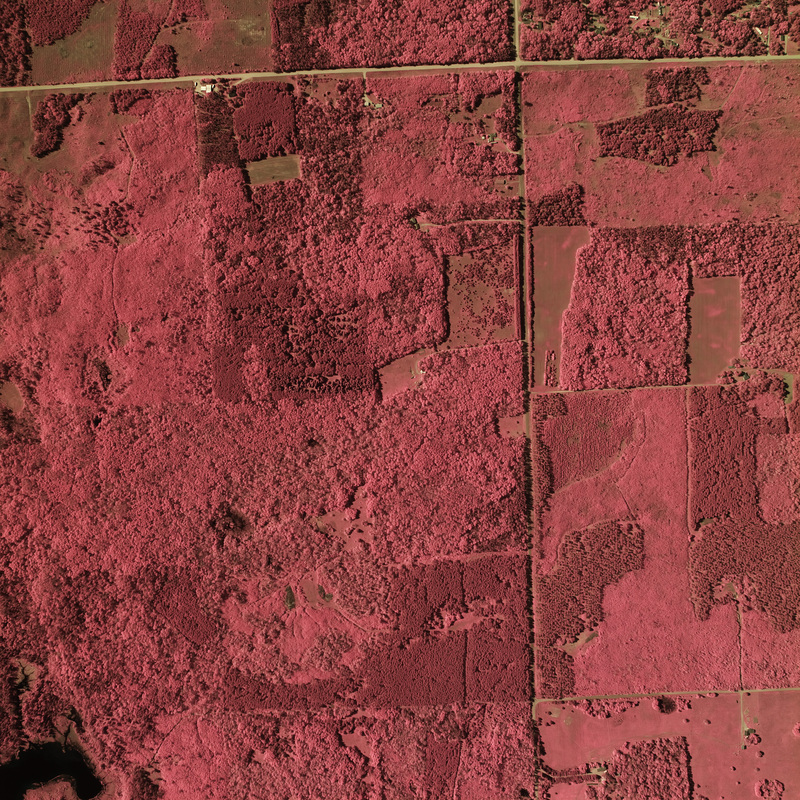 Dark and medium red areas are the conifers White Spruce and Red Pine respectively. 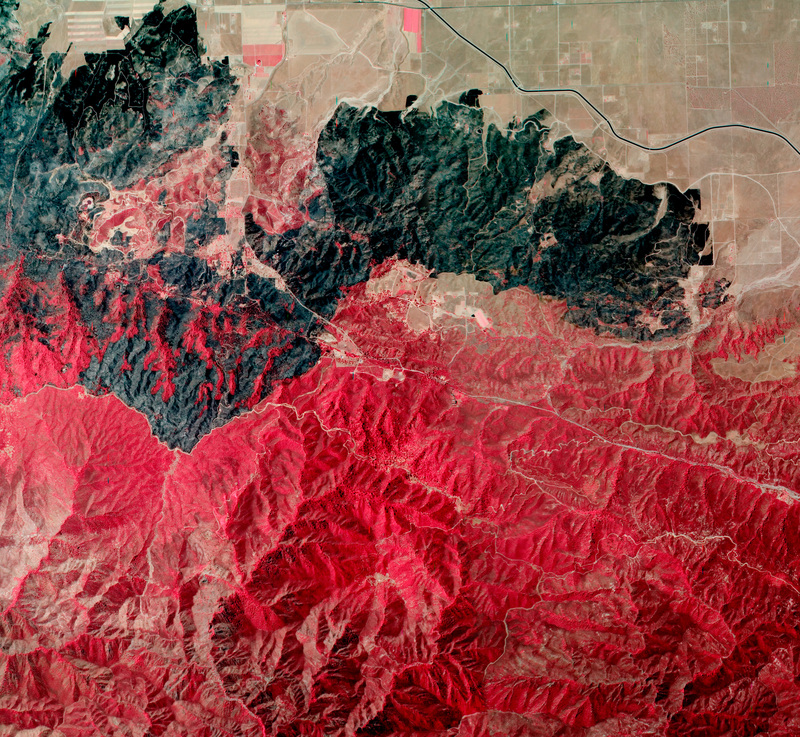 Lighter pink areas are Aspen, Maple and Oak. 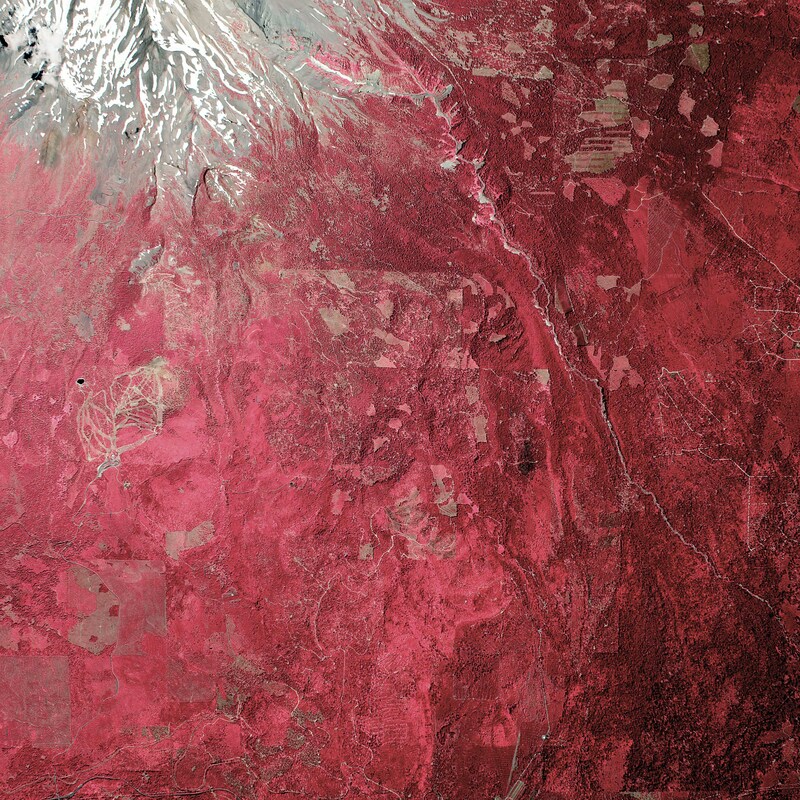 This image of California's largest Forest, located in the northern portion of the State, shows the slopes & foothills of Mount Shasta. 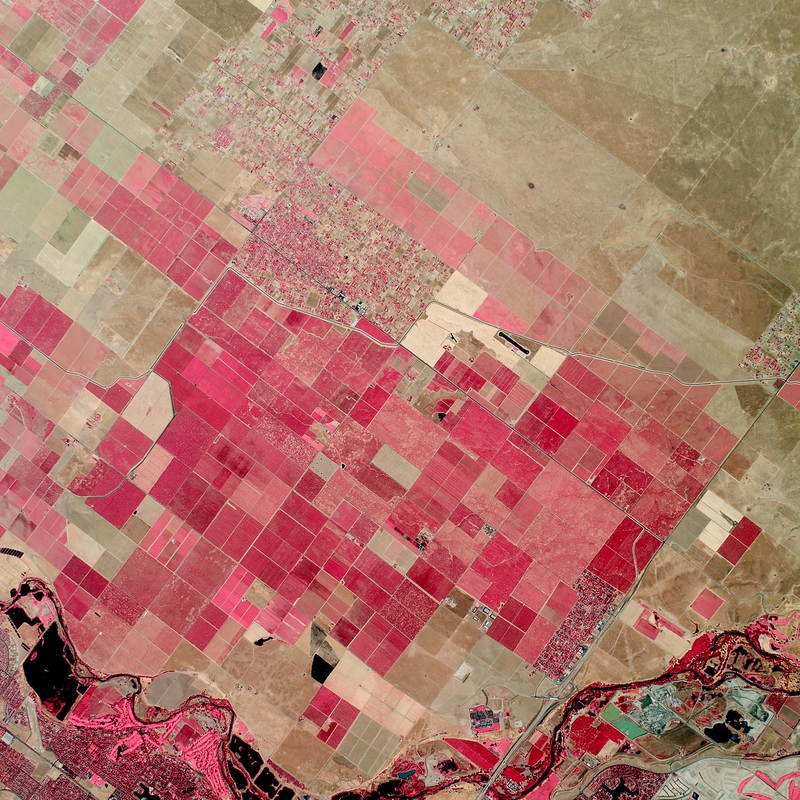 Ranch lands and a ski area are clearly visible among the trees. 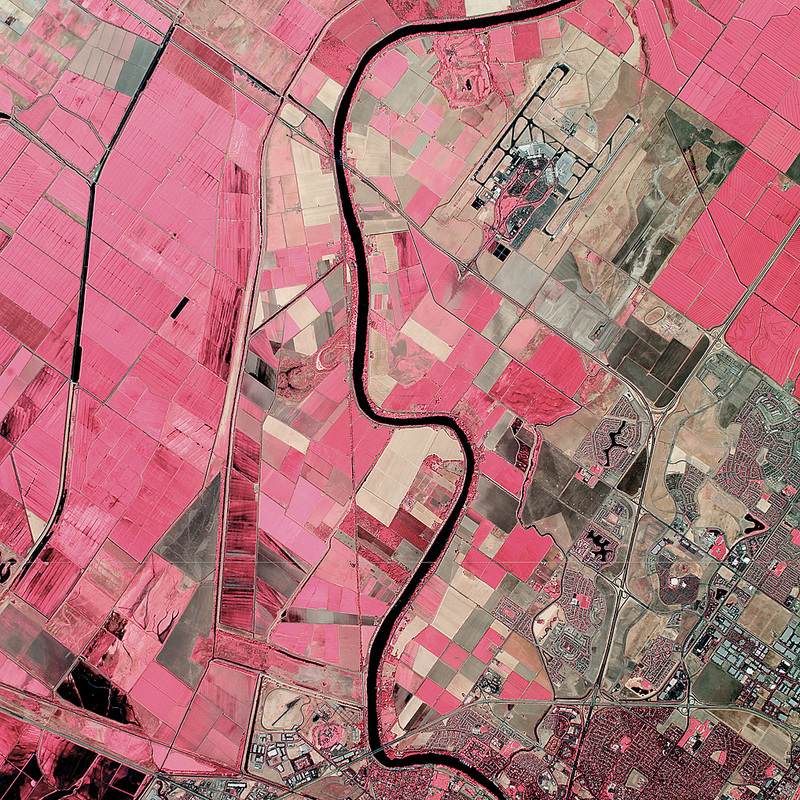 This image pair shows both Color Infrared and Natural Color of the airport, orchards, and surrounding countryside of this Northern California agricultural region. 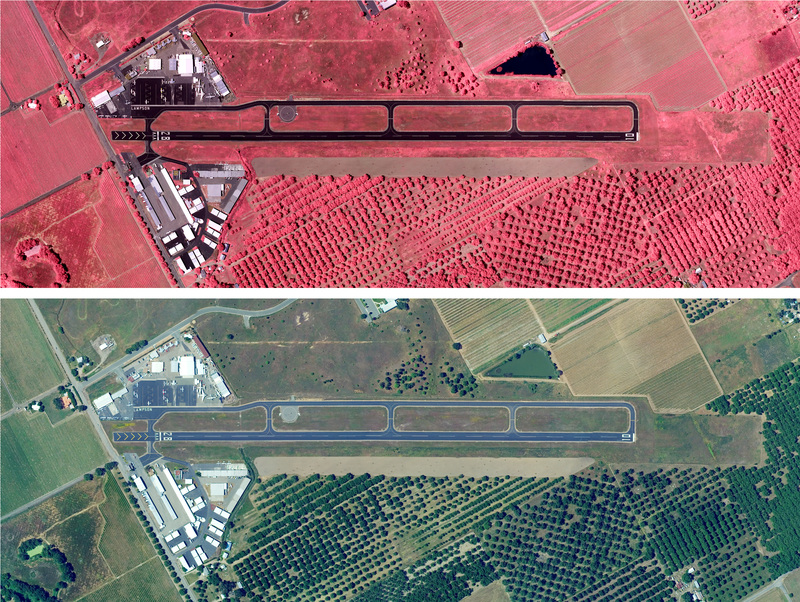 This image of the airport & surrounding plantations shows a diverse landscape that is hard to understand without the aid of Color Infrared Photography. This image captures a geothermal plant deep in the Mayacamas Mountains, where naturally occurring steam below the earth's surface is being harnessed to make electricity. 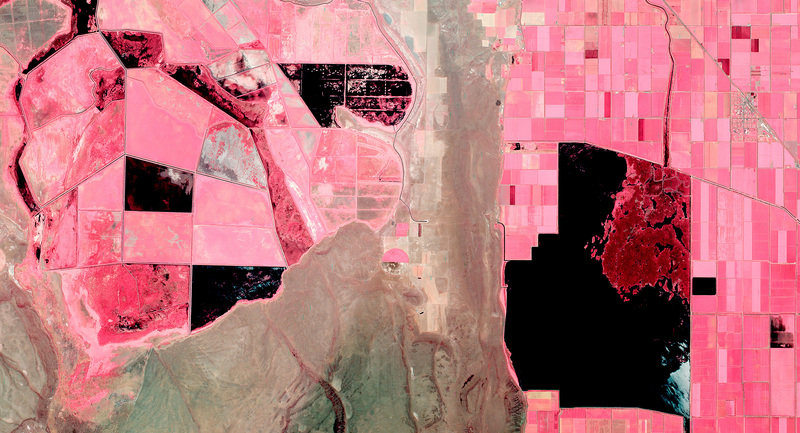 This mosaic of an intermittent lake in Northeastern California, along the border with Oregon, shows heavy agricultural activity in a relatively arid environment. Color Infrared Photography aids researchers and government officials in understanding the confluence of two diverse land-uses and the impacts they have on each other. 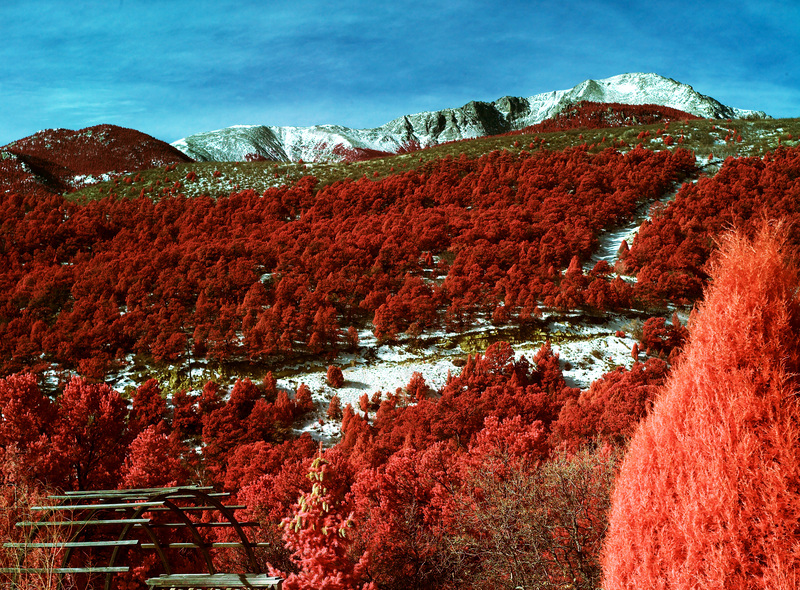 This image pair of CIR and NIR shows Rocky Mountain Juniper evergreen trees with bright red foliage contrasted with dormant, leafless deciduous Gamble Oak in the foreground. The vegetation on the near slope is a mixture of Juniper and Pinion with dormant Gamble Oak along the ridge below Pike’s Peak. 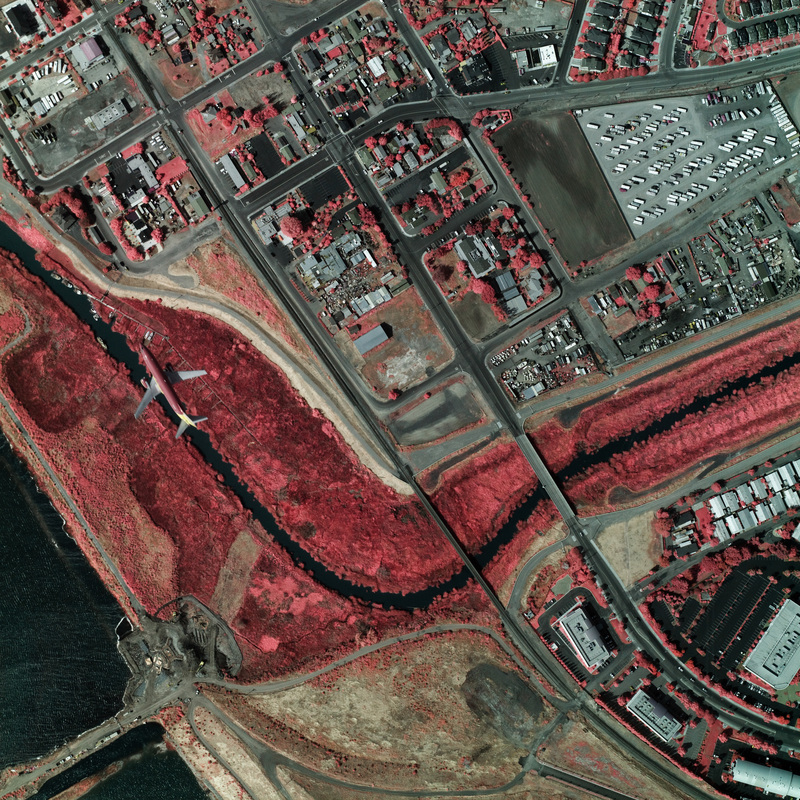 CIR imagery offers excellent atmospheric haze penetration, resulting in clearer aerial photos than natural color. These images highlight the usefulness of Color Infrared Photography for various research programs and governmental projects.